I’m all about making good use of what you already own. But if you’re not too crazy about what is in your wardrobe, why not spruce it up with a few embellishments? I love giving something a new spin just by adding new elements. So it’s no surprise that these DIY inspiration ideas focus on easy upcycling techniques. Here’s what I’m loving lately! DIY: Fabric glue and rhinestones… lots of them. Measuring tape and fabric chalk would be useful to space things out evenly. DIY: Attach (or just wear) a cameo necklace with a chunky sweater for the same look. You can do this with a few hand stitches. 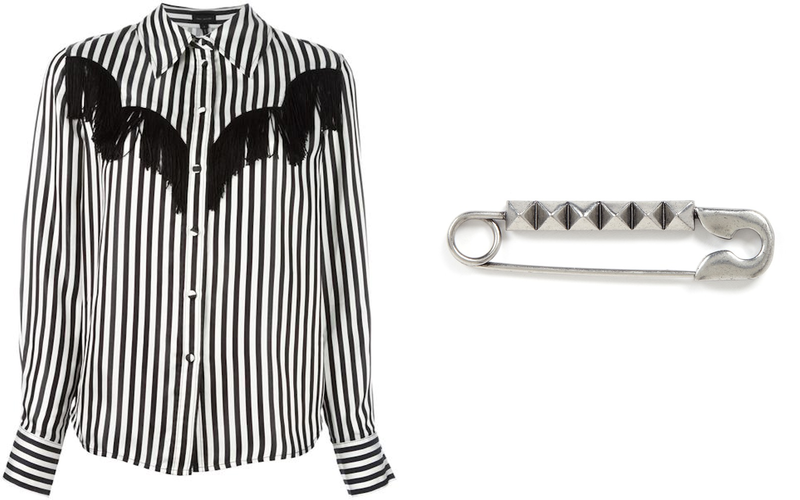 DIY: Fabric glue and fringe is all you need to embellish a shirt in a similar way. Loving the scalloped detail of that fringe. DIY: Tiny flat back pyramid studs (or brads from the scrap book section) glued on to a large safety pin. Easy! Need more ideas? Check out my archives of DIY Inspiration posts.